Reading from Excel in C# is actally not at tough as many VBA developers would assume. The simple reading is actually quite straightforward – there is only small little trick, requiring the adding of the Microsoft.Office.Interop.Excel reference to the Visual Studio project. After this, it is like using a bit of VBA in the luxury of Visual Studio. Two methods are compared – reading from Excel with Async and Reading from Excel Sync. 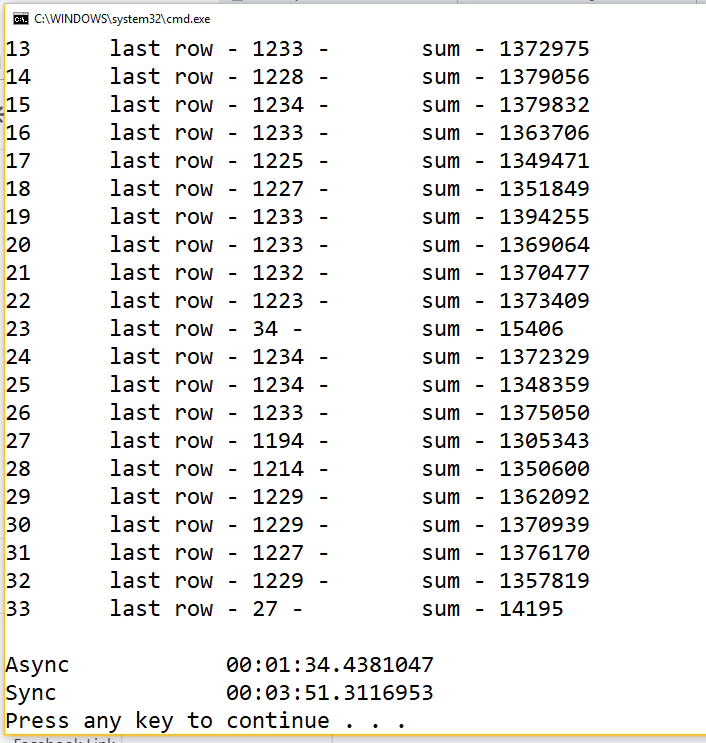 The reading from Excel with Async reads all the worksheets in the same time and thus provides better results. The Sync method reads one by one. While reading the worksheets, an information is displayed. Thus, it is visible that the async is not reading one by one. At the end the results are displayed at the console. On the next line, the await keyword asks the program to wait, until all worksheets are processed. In the CalculateSingleWorksheetsAsync, the worksheets are passed as a coming argument. The await Task.Run(()=>) returns the sum of the values in the first column, if these are integers. At the end of the code, there is a printing of the information on the console, for which the Override ToString() method of the Information class is used. Still more than twice processing time difference in 33 worksheets is ok. The whole code is in GitHub here. The ExcelFeatures.cs is probably going to be enlarged. If you have any ideas for improvement, feel free to submit a pull request.